The third day [Christ] rose again, according to the Scriptures. I don’t think I can improve upon that statement. I believe it, and I don’t even have to cross my fingers when I recite it. At the same time, I’m glad the Creed leaves a good many things unsaid. I’m glad those fourth-century theologians and church leaders had the good sense not to hammer out a detailed time line with lots of biblical cross-references. I’m glad they didn’t try to shoehorn every possible statement in the Bible about when or how Jesus would come in glory into a self-contained system of belief. It was apparently enough for them to assert that Jesus would return. Pastorally speaking, that was what mattered, and that was enough. In the religious circles I tend to run in, there are a lot of people who grew up in churches that were saturated with the teachings of Hal Lindsey, Tim LaHaye, and other purported experts on end-times prophecy. They grew up with that kind of theology, but somewhere along the way, that theology got, well, left behind. But that history may suggest a certain hesitancy in addressing what Paul really does say about Christ’s coming in glory. There’s no profit in a lesson about contentious end-times scenarios. Rather, perhaps it would be wise to take a page from the playbook of the early church fathers and strive to lead people to a firm conviction that Christ’s coming is a cause for celebration and a source of hope. • What have you heard or been taught about the return of Christ? • What of this teaching do you still believe? Where have your beliefs changed? • Where do you find hope in this passage of Scripture? The Gk. 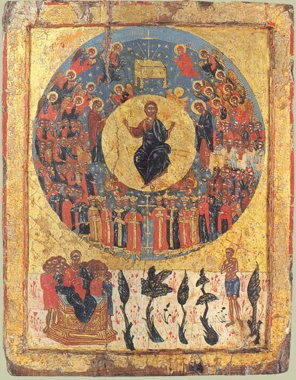 word parousia means “arrival,” “coming,” or “presence.” In Greek literature the word most often indicates the reaching of a destination in the normal course of life, but parousia was frequently employed in reference to a special appearance or visitation by a ruler or god; and so, in the Greek world the word could be understood to have a technical force. Transliterated into English the word parousia functions as a technical term for the coming of Christ at the end of human history, as depicted in the NT…. While there is debate whether or not the early Christians believed that Christ would necessarily come soon (an expectation described as “the imminent parousia”), it is clear that the anticipation of Christ’s coming was a consistent part of early Christian belief. As noted, the earliest traditional material and writing in the NT record this hope, but what is likely the latest document in the Christian canon, 2 Peter (3:12), maintains this same expectation. Furthermore, the Book of Revelation bears extensive testimony to the early Christian anticipation of the coming of Christ…. These and similar passages demonstrate the eschatological character of early Christianity. The basic belief of early Christians had a future dimension that focused hope in relation to the fulfillment of God’s work in Christ at the end of history. This hope was both personal, related to the person of the risen, glorified, and returning Lord Jesus Christ, and universal, relating to the work of Christ in his return which would affect all of creation as his power and glory dominated the entire cosmos. Marion L. Soards, “Parousia/Second Coming,” Mercer Dictionary of the Bible, ed. Watson E. Mills et al. (Macon GA: Mercer University Press, 1990), 646. Reasons for the heightened apocalyptic perspective of Thessalonians come from numerous sectors. One reason for the overwhelming number of eschatological interpretations was that New Testament scholarship went through a period when scholars thought they saw an eschatological explanation under every bush. J. C. Beker, in the 1980s, advocated that apocalypticism was the controlling factor in Paul’s thought and missionary activity. Others followed that path. A second reason, perhaps, for the eschatological frenzy in studies on Thessalonians is the parallel mode of research in Jesus studies. While Pauline scholars were viewing Paul’s writings through this eschatological lens, Jesus scholars had been doing the same since the work of Albert Schweitzer in the early 1900s. Paul’s eschatological fervor was inherited from an eschatological Jesus. A third reason that explains the eschatological focus in contemporary scholarship relates to the increased apocalyptic fervor of the end of the second millennium. Political tensions in the Middle East and the fear of economic instability have contributed to a general surge in the apocalyptic industry. People want to know the future, especially in times when the present looks bleak. And so we turn to the Bible—to Daniel, to Revelation, and to Thessalonians—hoping we can find the key that will unlock the mysteries as to when it all will end. Maybe the secret code is locked within this letter. Maybe there are secret meanings that would unravel the mystery of past and future. Perhaps if we had the magic wand to wave over Paul’s ancient letter, we could know for certain when things are going to wind down. We could at least know when to begin to turn the lights out. But as Malbon suggests, Paul’s writings are not necessarily intended to provide a secret code for us, not even particular facts. Paul’s words are intended to create a space for comfort for his grieving friends, not a millennial event chart for eager sky watchers. Paul’s words are written to create a sense of presence, apostolic parousia (Paul’s coming), as he describes the parousia (the coming) of Jesus Christ. Malbon writes, “It is as if Paul answers the questions and comforts the anxieties of the Thessalonians concerning the absence of those who have died on the basis of his own experience of questions and anxieties brought about by his absence from the Thessalonians.” Paul uses his friendship and presence in this letter to comfort his friends who are grieving over the recent deaths of their loved ones (4:18; 5:11). Linda McKinnish Bridges, 1 & 2 Thessalonians, Smyth & Helwys Bible Commentary (Macon GA: Smyth & Helwys, 2008), 118–19.